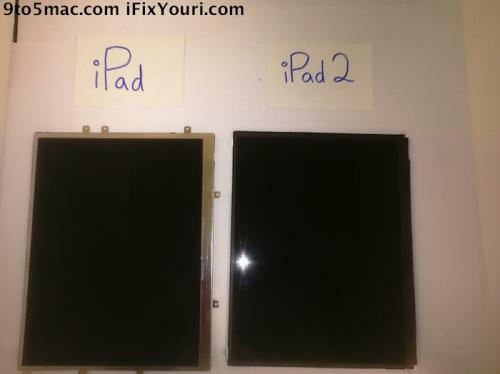 iFixYouri and 9to5Mac have posted photos of what is said to be the new iPad 2 screen. At this point, we cannot tell if the resolution is higher (or "Retina") but it is definitely higher quality in terms of its build. The iPad 2's display is also lighter, and over a mm thinner than the current iPad's display with a smaller surrounding frame. No other details (such as resolution) have been revealed, but the slightly thinner screen agrees with previous analyst reports that claim that the iPad 2's screen will be 30-35% thinner as well as offering an anti-reflective coating for better outdoor usage. Apple is widely expected to release a new iPad in the first quarter of this year. Update: One commenter at 9 to 5 Mac has deciphered the new screen's model number of LP097X02-SLN1 as indicating a 9.7-inch H-IPS display from LG with the same 1024 x 768 resolution as the current iPad.